I mean, that one just makes no sense to me whatsoever. Not only are then in some seemingly random order, but you suddenly get +5V in the middle. Unfortunately the question is closed and locked, so no answer will ever be forthcoming. So, why exactly was the power pin placed slap bang in the middle of the data pins? Does anyone who worked on the design know? 1 What exactly got me to search out the above question was a recent board layout, that I was doing, which incorporated two CD4028 ICs, and I found that the pin out of their data lines is just horrific. In addition to Tommy's answer: it is important in designing an IC that uses a lot of power and has large fast variations of power usage (the Z80 is nothing to today's chips in that regard, but it was pushing the boundaries of what could be done in the 70s) that any connection paths that carry a large amount of power are as short as possible, so that impedance caused by variations in power usage don't cause parts of the chip to be run either under or over specified voltage. To this end, connecting VCC and GND is best performed in the middle of the edges (and better still in multiple places -- but the Z80 didn't have enough pins to allow for that). Because of the way the die is aligned in the package, this means that the pins need to be roughly in the middle of the edge (at opposite corners is another approach, which would have the lines landing on the middle of the die on the edges that are mounted across the package width, but then the wires connecting the pins to the die are longer, which is also a potential problem). [I]nstead of a single data bus, the Z-80 has a complex data bus that is split into 3 segments. [...] The motivation behind splitting the data bus is to allow the chip to perform activities in parallel. [...] The complex structure of the data buses is closely connected to the ordering of the data pins. First, because the Z-80 splits the data bus into multiple segments, only four data lines run to the lower right corner of the chip. And because the Z-80 was very tight for space, running additional lines would be undesirable. Next, the BIT instructions use instruction bits 3, 4, and 5 to select a particular bit. This was motivated by the instruction structure the Z-80 inherited from the 8080. Finally, the Z-80's ALU requires direct access to instruction bits 3, 4, and 5 to select the particular data bit. Putting these factors together, data pins 3, 4, and 5 are constrained to be in the lower right corner of the chip next to the ALU. This forces the data pins to be out of sequence, and that's why the Z-80 has out-of-order data pins. So you need 3, 4 and 5 in the lower right corner for efficient implementation of BIT, SET and RES. The rest he sort of hand waves away, but one could dare guess that 5v ends up in the middle because its just a lot easier for routing if power arrives in the middle of the die and that the other bits are arranged just as it was convenient to feed the random logic. As always in a real life situation decisions must be made based on contradicting requirements. In this case optimal power supply and easy PCB design are an examples where both are good considerations but hinder each other. For simple PCB design it's quite handy if supply power and ground are on opposite 'ends' of a chip (*1). Having one at the 'upper' end (where the mark is) and the other at the lower end (*2) allows a design with a power bar running along one side and a ground one along the other. With a little luck when routing and the usage of rails (*3) it may allow the use of single sided boards with a minimum of discrete wiring (jumpers) - or at least keep a design within two layers. Multiple rows of chips lead to a design with a pair power traces (or rails) running along the middle as seen on many boards. On the other hand, for a good power supply it's handy to have a right-sized capacitor as close as possible (short routing/wires) to the power supply pins to buffer switching needs. The higher switching frequencies get, the more important this is. Placing power and ground at two adjacent pins would allow adding a capacitor right next to them. Also, placing both of this pair near the middle of an edge further shortens the wire length, as the internal part of these pins (which in turn are bonded to the die) are here the shortest of all. Of course routing of power lines will now be rather complex among all the signals. But still manageable - especially when again using rails (*4). Ok, But Then Why Opposite? It is desirable to have the same voltage between ground and power across the whole chip area (or as much as possible at least). Unlike simplified assumptions, semiconductors have a rather high resistance, about 10 to 1000 times of copper. Increased by the fact that conductanc is not only defined by the material, but also conducting diameter, power distribution across a chip becomes a serious issue (*5). And no, impedance isn't of much relevance for power supply, as we do not have an alternating voltage (6). If power was supplied by adjacent pins, the region where these pins are bonded in would enjoy full voltage, while the areas at the other 'end' would get a quite lower supply resulting at least in lower maximum performance if not worse. By placing them on opposite sides of the die, the voltage loss is somewhat compensated over most areas. None gets maximum voltage, but all get about the same (*7) which again is something easing circuit design of the chip. Putting both on opposite positions (horizontal (*8) or diagonal) is therefore mandatory. It's important to note that pins using a 'diagonal' layout (like TTL or most other) also end up in the middle of opposite edges of the die - after all, it's square (mostly) and pins are bonded all around. Bottom Line: Zilog's solution scales better with higher frequency and allows better signal quality, but requires a little more complex PCBs. *1 - At least for single voltage ones that is. *2 - I doesn't matter if both are on the same side (left or right). *3 - These are metal bands with pins in regular intervals like .6 inch or alike. With rails, the routing of power can be eliminated for major parts of a PCB. This was even more important with early automatic routing systems removing a whole dimension of complexity. *4 - Now standard .6" or 1" rails may not work as well, but it's still better than routing them among all the signals. *5 - That's also the reason why these huge modern chips have not just one or a few pairs of power pins but sometimes hundreds. *6 - It is of course relevant if we look at digital lines. *7 - Yes, there is still variation due to routing and so on, but it's much less than without this consideration. *8 - The PIO breaks this a bit by using 11/26 instead of 11/29 in favour of keeping all Port B pins adjacent. A little variation doesn't kill the principle. get all of the data lines together, and in the correct order? 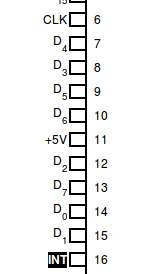 Data lines to RAMs have no correct order, they are all equal. The numbering is just a formality but has no real meaning. You can permutate them all you like, still the same data (bytes, words) will come back. For ROMs (including character generators) it's a different matter, if they are programmed externally. If you swap data lines for reading then in theory you could compensate for that in the programming. This holds for address lines too, but beware of messing with efficient addressing in pages. For I/O ports, especially parallel and serial ports, the precise bits matter, but that's nothing that a double sided PCB can't solve. Not the answer you're looking for? Browse other questions tagged z80 or ask your own question. How does the Z80 determine which peripheral sent an interrupt?